Powers VFW Commander Daniel Adams, left, relaxes on the porch of Post 6102 with son Jaxon, Quartermaster Paul Walter and canine pal Dakota. With broad community support, VFW members are rescuing the historic building. POWERS – Some towns might say the Powers VFW hall isn’t worth saving. In some towns, the swaybacked floor, the cracking walls, the rotten siding and the antiquated wiring might look like an invitation to a bulldozer. Powers, population 700ish, isn’t one of those towns. “This is a place where we’re all accustomed to coming together and solving problems,” said VFW Commander Daniel Adams. Adams, a veteran of two tours in Iraq, moved to town two years ago and went looking for comrades. At the Smith & Bern Veterans of Foreign Wars Post 6102, he encountered a once-vibrant group that had dwindled as its members aged and died. He quickly found himself in charge. Adams and the post’s quartermaster, fellow Iraq veteran Paul Walter, inherited a crisis along with their hats. The former church that housed the VFW was besieged by water. The historic building was all but abandoned. “It’s hard to have an active post when it’s crumbling,” said Phillip Wolcott, a Vietnam-era veteran and former post commander. The building sits in a soggy depression below street grade. Walls have cracked as the foundation has settled. Some of the floor joists rest directly on damp ground, and the vintage hardwood floor droops several inches in the middle. But Powers wasn’t ready to give up on the hall. Many older residents remember worshipping there when it was the Church of the Open Bible. Since then, volunteers have cleaned and painted the building. A water-damaged wall is getting new framing and siding. A ditch has been dug around the building to divert water. An Eagle Scout project provided a drain field. The big work remains to be done. Lifting the floor and walls requires tunneling under the building. And the original “knob and tube” wiring must go. Jackie Chambers, the Coquille Tribal Community Fund’s administrator, is excited to help. As the building slowly revives, it is reclaiming its role in the community. It houses the local food pantry, which attracts more than 150 people twice each month. From April through December, a “barter market” lets people sell or trade produce and crafts. A scout troop and hunter safety classes meet in the building. 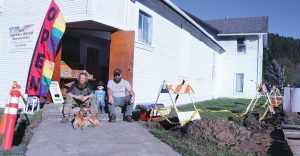 The Powers VFW was one of four historic preservation projects receiving grants from the Coquille Tribal Community Fund during its 2019 Grant Week, Feb. 23 to March 1. The others were the Bandon Historical Society Museum ($2,500), the Curry County Historical Society ($1,500), and the South Umpqua Historical Society ($5,000). Altogether, the tribal fund awarded $261,762 to 49 community organizations and programs.